Making several appearances on the grades of Cajon Pass and Beaumont Hill are Union Pacific Heritage Units #1983, #1988, #1995, and #1996. Union Pacific's #4141, the George H.W. Bush locomotive, performs two great run-bys for our camera, and both Olympic units are spotted on Cajon. You'll see everything from military trains, work trains, circus trains, and passenger specials to Metrolink's dazzling Holiday Toy Express. Our journey takes you to Colton Crossing, Beaumont Hill, the Cajon Subdivision, Fullerton, and Buena Park. Coverage also includes activity on the Yuma, Los Angeles, Alhambra, and Needles Subdivisions. Insightful narration and the beauty of the surrounding terrain enhance these striking images of trains battling nature. 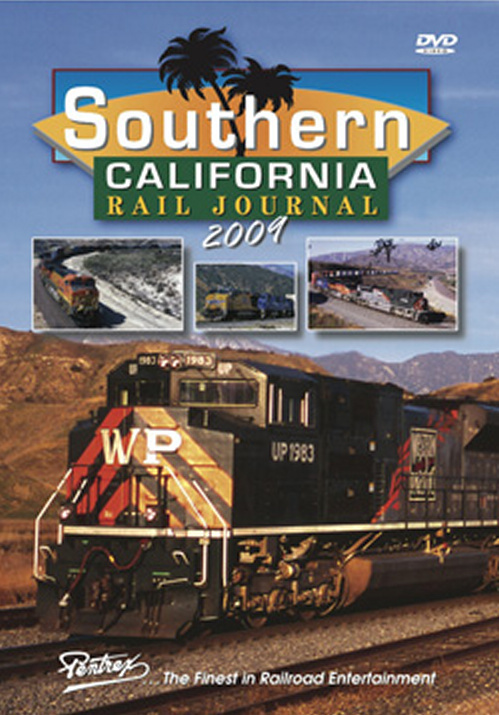 All this and more await you in Southern California Rail Journal 2009! chris collins (fletcher north carolina) on 2018-04-07 20:16:33.
jfw6435 (Littleton,Co) on 2012-01-31 21:36:12. Slightly different than what I expected from reading the dvd. Not a bad train video just not the coverage I anticipated. There was some interesting footage but they always cut it off too soon and seemed to focus more on the normal stuff instead of the stuff you rarely get to see. I would purchase this dvd on sale but it's not worth full price , I had planned to buy 3 of these videos '08,'09,'10, now I am not sure I'll buy anymore of them. gecatgjc (San Diego, CA) on 2012-01-31 12:12:59. Loved all the heritage units, foreign power along with assortment of locations. Would like to have seen more main line action a few more spots along the transcon. Good videography was a bonus compared those who just "point and shoot". A little over priced. I wouldn't have bought it if it weren't on sale. Overall, nice video to watch. I really enjoyed it.